Having a bad hair day. Look at my brand spanking new ring, though! Thanks Chili and Whimsy Love. They're making you happy, yes? That's all I ask.. Damn, that's cue. What is it? I have a pair of bakelite earrings that look like that. Yes, they are making me happy. Getting a present once a month? How can it not? Thank you! 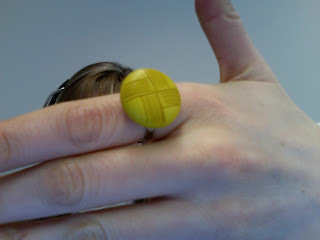 g, it's a vintage button made into a ring by a talented lady with an etsy shop. It might be bakelite but I'm not sure, I don't know a lot about that stuff.